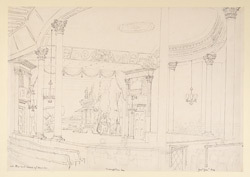 Pen and ink drawing of the interior of the Chowringhee Theatre in Calcutta, West Bengal, by William Prinsep (1794-1874), c. 1830s. The image is inscribed, "All the rest rows of benches, Counsillers box and Govr. Genl. box". Inscribed on the original mount: "Chowringhee Theatre holds about 800 persons in the boxes and 200 in the pit. Last scene of 'Blind Boy' set-my own drawing WP". William Prinsep, a merchant with the Calcutta firm of Palmer & Company, came from a family which served in India for several generations; five of his brothers were also in the country. The Chowringhee theatre was built in 1813 and was bought by Prinsep's friend Dwarkanath Tagore in 1835 for Rs 30,000. It burnt down in 1839. This view is from the circle looking towards the stage showing the first few rows of seats.